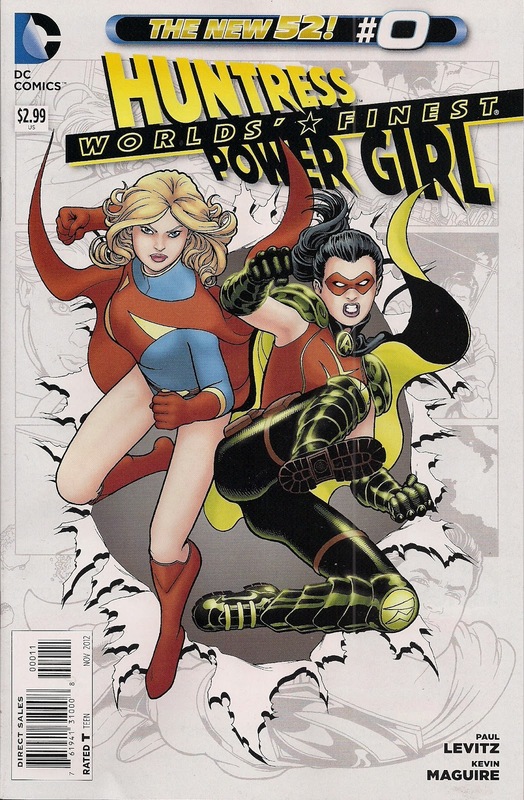 In the first issue of Earth 2 we saw how Supergirl and Robin were bumped from their own world to Earth 1, where they refashioned themselves into Power Girl and the Huntress. 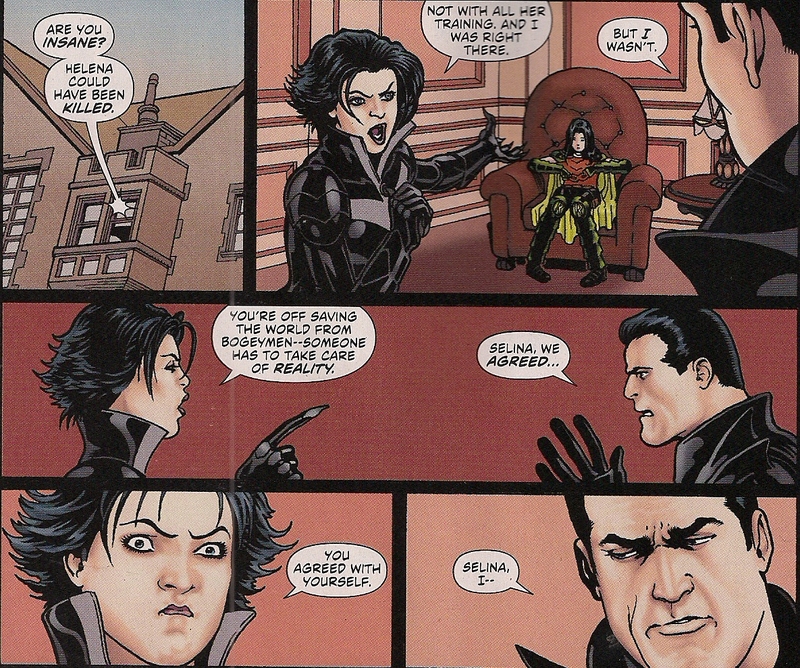 Here, as part of DC’s zero month, we see their earliest days as crimefighters, and how they met. I hope that at some point Levitz writes a story featuring the home life of Mr and Mrs Wayne, because the brief look we get here (click on image to enlarge) shows a pleasingly passionate pair. It seems that, if not henpecked, Bruce Wayne isn’t the only one wearing the trousers. Or Bat-trunks, as the case may be. Levitz contrasts the youthful enthusiasm of Supergirl with the melancholy of her cousin, and outlines what must be the first piece of advice given any Robin, but it’s one I don’t recall seeing previously. Basically, the issue is filled with smart character bits, clever detail and hints of stories not fully told. And the artwork of penciller Kevin Maguire and inker Wes Craig is just edible, replete with great expressions and telling body language. Robin is spunky with her parents’ confidence, Supergirl sweet yet strong, Catwoman a motherly vamp, Bruce the concerned Dad and Superman the father figure of them all. The action sequences are fluid, and the Supergirl and Robin costumes so good that it’s a shame we won’t see them regularly; certainly, Supergirl’s outfit is miles more attractive than the Earth 1 Kara’s nightmarish togs. Whether you’re a fan of the Superman or Batman Families, Silver, Bronze or Modern Age, or just the new Earth 2 series, there’s something here for you. This is one of the few titles I like. You, sir, have god taste.